Wig Design by Flora is proud to announce our new partnership this fall with Sharsheret, the only national breast cancer organization dedicated to addressing the needs of young Jewish women facing breast cancer. Please join us in efforts to raise breast cancer awareness and support for this wonderful organization. Together we will save lives! Walk With Us: Race for the Cure, Sunday, September, 14th, Central Park NYC. Design By Flora has been named this year�s Team Sharsheret Benefactor and our company name logo is prominently and exclusively displayed on the front of the bright green t-shirts that will be worn by all the 500 Team members. 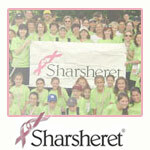 To sign up for Team Sharsheret today, visit www.komennyc.org, click �Join a Team� select �Team Sharsheret�. If you are unable to join us, please feel free to make a donation to Sharsheret at www.sharsheret.org, click on �Donate Now,� and type in Flora by Design in the Reciepient Name box on the bottom on the donation form. Wig Design by Flora has also been designated as a 2008 Sharsheret Corporate Partner and we will contribute a portion of our proceeds from sales to Sharsheret�s national programs and services. To make a direct donation to Sharsheret, please visit www.sharsheret.org, click on �Donate Now,� and type in Design by Flora in the Reciepient Name box on the bottom on the donation form. Thank you, in advance, for your participation in such an important cause. Our efforts will help raise awareness about breast cancer and its impact on the Jewish community. Together we will save lives! Get more for your wedding! Don't forget to mention ChossonKallah.com when visiting Sharsheret.